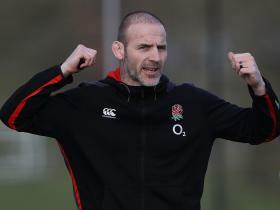 Paul Gustard insists that the chance to take the top job at Harlequins was one “too good to turn down”, but when a role in the Premiership is more appealing than taking England to the Rugby World Cup, it simply does not reflect well on Eddie Jones’ regime. Noises out of the England camp were that Gustard will depart Jones’ backroom team with the Australian’s full blessing and support, even though it leaves him short of a defence coach and a full-time attack coach fewer than 16 months before the 2019 Rugby World Cup – the tournament that Jones has made plainly obvious that he intends on winning. For the first two seasons of Jones’ tenure, his ‘win at all costs’ attitude reaped huge rewards in two Six Nations titles, one Grand Slam and series wins in both Australia and Argentina on top of an 18-test unbeaten run. But the wheels have come off Jones’ wagon in more recent times, with three straight defeats in this year’s Six Nations and a daunting three-Test series with the Springboks next month threatening his attempts to try and repair his chariot. When a team that places such emphasis on winning stops winning, questions and criticism follows immediately. Jones has not taken well to this, having mentioned that he has become a “bad coach” overnight with more than a hint of sarcasm, yet now he faces a win or bust scenario – beat South Africa and his World Cup preparations are back on track, lose and England’s losing streak shows no signs of halting with coaches preferring to jump ship for Premiership opportunities. What doesn’t make sense though is why Gustard would want to leave now. The 42-year-old is well-liked, well-respected and could make his name at Quins if he’s able to rebuild them into a force of English rugby – after all, they won the Premiership just six years ago. But on the face of it there are few obvious answers to why Gustard would relish a club job instead of one with the national team that harbours ambitions of lifting the Webb Ellis Cup. The national team is supposed to be the pinnacle be it England, New Zealand or any other country, and having spent the best part of three seasons working under Jones, you have to question why Gustard wants to leave now when he could conceivably do so in 18 months’ time and expect one or two Premiership jobs to be available within six months. But while Gustard may still be heading out to South Africa on tour before leaving the role, the story has already become about what next for Jones and who will join his backroom staff next. He has previously brought in other coaches from outside his team to assist with preparations – both from within rugby and from other sports too – and most notably they have usually had some sort of existing working relationship with Jones. George Smith, the former Australia flanker, came in to help with the breakdown, Jason Ryles of the Melbourne Storm has worked with Gustard on defensive matters and Scott Wisemantel, Jones’ former assistant with the Wallabies, will head to South Africa to try and improve the attack. It would be no surprise to see Jones delve Down Under once again to recruit Gustard’s replacement, although the RFU insist that the process is not limited and will be a widespread search other time to fit with Jones’ plan for next season – the final full campaign before the 2019 Rugby World Cup. Time is clearly starting to run out though, and given where England seemed after their 2016 Six Nations Grand Slam, they appear to be stuck in a regression that they are not showing signs of shirking. That’s why South Africa becomes so important for Jones. Win and there will be respite ahead of this autumn’s four-Test schedule against the Springboks, Australia, Japan and most pivotally the All Blacks. Lose, and England’s hopes of challenging the world’s best side at next year’s global gathering will be impossible to even dream about.